If you can afford it , this is a beautiful and luxurious body creme that will leave you feeling like a princess. My little sister moved to NYC some time ago and something happened to her while she was there. She’s developed expensive taste… in everything. Mind you, she’s far from a snob and she’s definitely not spoiled, she works hard for everything she’s got, she’s just got a knack for picking out the best of everything. 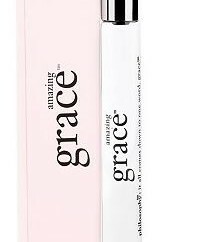 From restaurants, to hot chocolate, to this: Amazing Grace Whipped Body Creme. 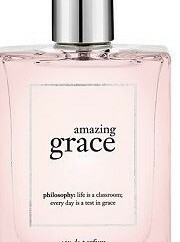 This Christmas, she sent me a 4 pack of Philosophy’s line of Amazing Grace bath and body products. It was a beautiful package of their perfumed shower gel, their perfume and their whipped body creme. Beautifully packaged in a light pink and silver box, I knew just by looking at them that these items were going to be very special. Now you have to understand, I am a Bath and Body Works girl, so I like to smell good but I don’t like to pay a fortune for my body lotions. To be completely honest, I never even knew that there were body lotions out there that could possibly smell better or feel better than the lotions I currently use, I guess I’m just an unsophisticated Texas girl ( no offense to Texans). But when I opened the jar of Amazing Grace Whipped Body Creme, the scent that I took in was, for lack of a better word: Amazing. I felt like I just wanted to sit there for a little while and keep inhaling the scent. 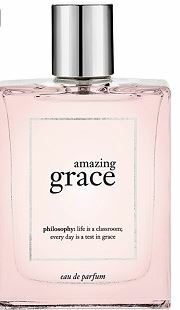 I love floral scents but they have to not be too strong or overpowering (my husband is very sensitive to scents). This scent is very clean and crisp, light and refreshing. It is a perfumed lotion with floral and citrus notes, and a little white musk permeating it too. More than just the beautiful scent, this body creme is very light yet luscious. It has a unique consistency and very different from every other lotion I have ever used in the past. 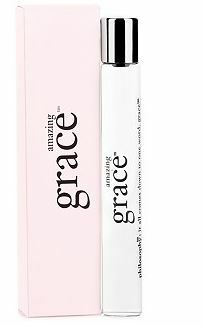 The Amazing Grace Whipped Body Creme is light and airy, like a light whipped body butter but it does not feel greasy or heavy in the slightest. It almost seems to melt into your skin, it feels like your skin drinks it up and absorbs it very well, leaving your skin very soft and with a pleasing perfumed floral aroma to your skin. I suggest sliding it onto your skin right after a shower, you’ll find that your skin soaks up the body creme almost instantly , softening it and giving your skin a velvety texture. The body creme’s perfumed scent also seems to cling to your skin better (and longer) when applied right after a shower or a bath. When I would combine the whipped body creme with the shower gel and the perfume, I honestly felt like a VIP. It just didn’t get better than that! It was an absolute luxury and I just plain smelled good. I would get compliments all the time, ( a lot of them from my favorite person in the whole world, my husband) and people asking me what perfume I was wearing. The scent would last just about all day, I would still catch whiffs of it when I would climb into bed and my husband loved smelling the lovely scent on my skin and my pillows. It was such a luxurious feeling to bathe in that scent and then slide on the fragrant body creme. I probably should have rationed it more to be able to use them on special occasions but I couldn’t help myself, I enjoyed this lovely gift from my sister thoroughly and I’m glad I did, life is too short anyway, right? Alas, my Christmas supple has dwindled and I very sadly will have to wait till next Christmas and hope that my sister will have pity on me and send me another set of this body creme. So for those of you who have a special occasion coming up where you want to small like a million bucks, I’m telling you, this is the way to go. 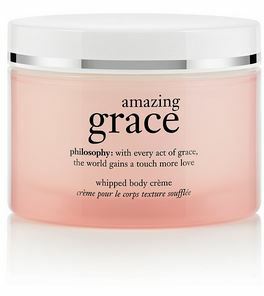 Amazing Grace Whipped Body Creme is made by Philosophy and sold at Sephora.